The last couple of visits to Wishtree Wood have been our most productive yet. At Easter, for the first time in nearly 3 years we experienced the longest period of fine weather, giving us the opportunity to excel in the tasks we did. Implementing our ideas has lovingly become nicknamed as dot to dot, gradually bringing each section of the land together. There was an initial plan to the acre clearing but by looking at what elements already exist, such as fruit trees, we decided to adapt it. This is David Holmgren’s 1st principle “Observe and Interact”. Without intention we realised we were organically bringing things alive, each part giving a purpose to what will become a whole. We looked at natural patterns to “design from patterns to details”, the 7th principle. We found exactly this when we discovered a seasonal stream, digging out the path it took to help it along. We could ‘see’ where we should open up pathways through the wood, the edge of a tree line guiding us. Some areas we will look at and discuss what it could be, a growing space or a place where we should place an element. We’ll do this for months before one of us will have a eureka moment and through further discussion and drawings, we will finally give it a purpose. A very good example of this was using the 12th principle “creatively respond to change” . In order to plant a productive forest garden, we had decided on certain trees we would replace more edible ones with, bird cherry was one of these. For about 18 months we had decided a particular bird cherry would be removed to make way for a fruit tree. Then…this Easter we were very easily persuaded by Gaia that this shouldn’t be the case. It took us nearly 3 years to decide that bird cherry was in fact a species of tree to be revered. We observed the insect life that buzzed and hummed amongst its beautiful flowers. We were intoxicated by the seduction of its scent. We were in awe of its ability to sucker and layer itself, making it a great hedging variety, growing quickly. We succumbed to the comfort it offers in providing us with warmth as an excellent wood for fuel, seasoning quickly and burning hot. Now we are accepting this wonderful feedback and changing some of the plans to the forest garden design. 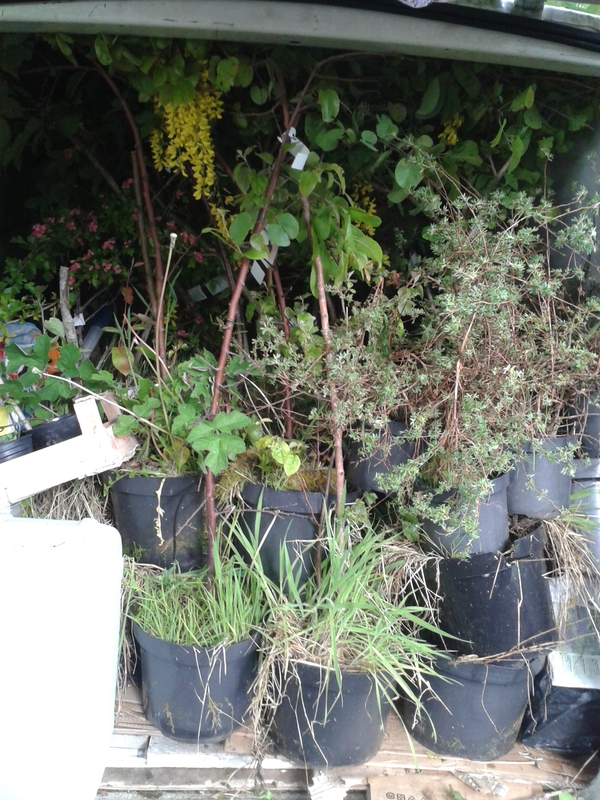 May bank holiday, we arrived with a van stuffed full of trees to be planted, kindly donated by Willis Lane Sustainability Centre (Pennyfield Permaculture). We used these to bridge the gaps of woodland, placing a few of the more ornamental trees around our camping area, to enhance the aesthetic appeal of this part of the site. We tried to get as many trees in as possible in the short time we had, adapting our design as we went along. Occasionally the heavy rain stopped us, giving a good excuse for that all important coffee break or pause moment as we like to call it. Very few of these trees were a part of our original plans for our Forest Garden, and some were a complete surprise to us, but the opportunity to have them was too good to miss, and so our growing agroforestry system is now some 35 trees richer. We had a few that fitted perfectly with our plans for the forest garden, and after much scribbling and crossing out on our design; we were also able to incorporate some medlars, black walnuts, plums and pears. Beyond that, we had to get inventive. We had previously discussed putting more trees down at the lower end of the wood, where we plan to site our bees in the future. Our initial thoughts were for this to be more of a food hedge-type arrangement, but we walked around the area, had a chat about our options, and after some thought, decided to make this area into a small apple orchard, with 8 trees of mixed varieties scattered either side of the ride. Our other main task for our May trip was to prepare for our first LAND (Learning and Network Demonstration) Centre assessment, and we had spent some time going over the assessment criteria in anticipation. However, the day before the scheduled visit, we discovered that our tutor would not be able to make it. Obviously this was disappointing, but we had just received a message from one of our donators, asking if we were free for a visit. Due to the cancelled LAND assessment, we were, and so spent a lovely couple of hours walking the site and having some lunch. We now of course have longer to prepare for the rescheduled visit, and were able to sit back in the beautiful sunshine on Sunday afternoon, watching the swallows swooping overhead, and enjoy the feeling of satisfaction that our weekend of adaptation had given us. Not only have we been more productive this year, so far, with implementing and observing on the land but we have been inspired by the people we have met and the lessons we have learned. Our visits to local permaculture projects both in Devon and London have indeed inspired us, not forgetting our participation in a skill share event in Somerset. Our Devonian neighbours have been important too. Offering us a chance to share in their skills and knowledge and to accept and welcome us into their homes has been wonderful. This year is our year for momentum and change, transitioning to the next stage of our journey. As our daughter prepares for a career in teaching, our son settles into his new family life and we prepare for whatever new adventures await us, we think of how far we have come and how lucky we are to have the opportunity to live the right livelihood. Responding creatively to any change, even if it appears to have obstacles at the time, can in fact give way to new ideas and opportunities.